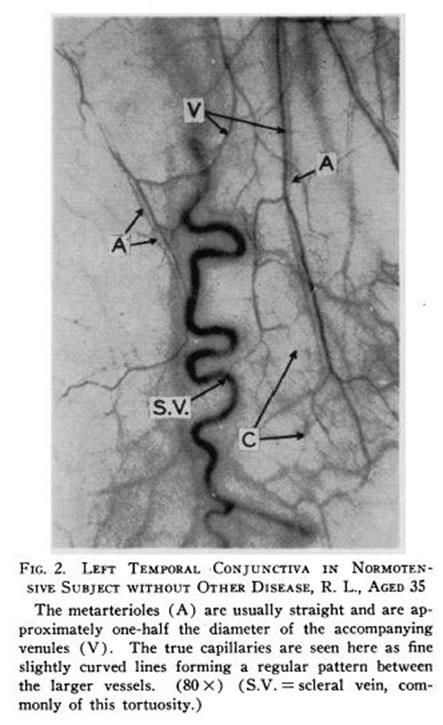 This research into peripheral vascular reactivity, carried out with only the basic technologies available 55 years ago, is a landmark study of conjunctival vascular hemodynamics. In this study, the vasculature of the bulbar conjunctiva is subject to a number of examinations, including description and measurement of vessel geometry and morphology, measurements of peripheral blood flow, and response to both topical epinephrine and cold pack. In this review, the methods and results are summarized with additional commentary and interpretation. Based on quantitative microscopic observations, the study compares the structure and behavior of conjunctival vasculature among patients with and without hypertension and other disorders. Comparison of the results from Groups I and II illustrates the effect of hypertension and vascular disease on microvessel structure and function. Comparison of results from Group III with those from Group I illustrate the effect of non-hypertensive diseases on the microvessels. Group III was included to show how the amount of random variability in characteristics present among subjects with non-hypertensive disease is relatively high in comparison to the consistent pattern of responses found among the hypertensive subjects. 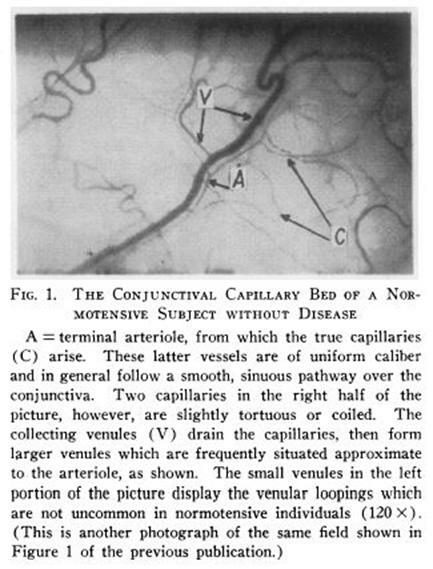 Detailed examination of the structure and behavior of the conjunctival microvasculature can be useful in detecting incipient pathology, and with recently available camera and photogrammetric pattern recognition technology, the method can be automated and applied to digital eye images for screening hypertension risk. Peripheral vascular reactivity can be monitored via microscopic examination in studies of functional aspects of muscular vessels in the capillary bed of living mammals. In prior studies, comparison of several hemodynamic disturbances (such as hypertension, acute hemorrhage, prolonged hypotension) showed that each separate condition had a distinctive characteristic status reflected in the capillary bed of the mesentery. In animal studies, it has been observed that the mesenteric vascular bed in experimental renal hypertension was predominantly constricted, with ischemic arterioles and capillaries, and a similar elevation of epinephrine response, along with hyperplasia of vascular elements. No single feature was found pathognomic or characteristic of any of the experimental syndromes, however the combination of indicators considered together found among the hypertensive group was found to be consistently characteristic. Observations of the conjunctival vessels among subjects in each of the three groups included both qualitative and quantitative evaluations of the structure and function of the vessels, as well as the vascular response to locally applied epinephrine and cold packs. 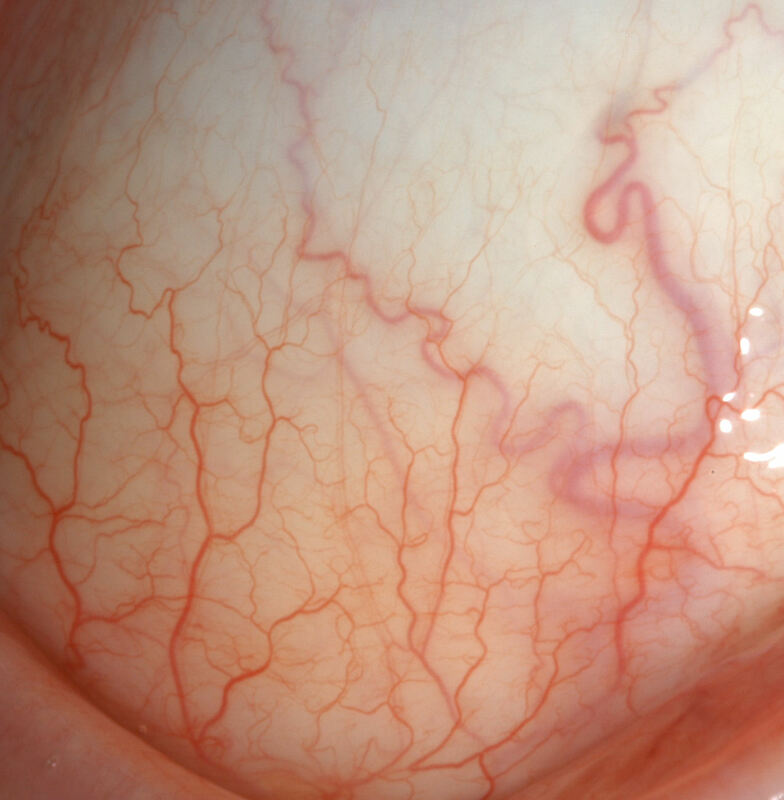 First the state of the capillary bed was noted, including conditions such as ischemic, plethoric, euvascular, vessel tortuosity was graded, and spontaneous vasomotor activity in the precapillary sphincter was graded. Second, the velocity of blood flow was measured in metarterioles, capillaries, and collecting venules. Measurement was made by observing the vessels at 47X, and recording the transit time of blood cells across a relatively straight segment of length 70 to 100 microns. Third, spontaneous vasomotor activity was measured in terms of responsiveness to applied stimuli. Vasomotion is an apparently spontaneous variation in caliber resulting from contraction and relaxation of the vascular smooth muscle. The vasomotor reactivity of the vessels to topically applied epinephrine and cold pack was graded in terms of amount of stimulation required to elicit threshold vasoconstriction. The sensitivity to topical epinephrine was graded by applying increasing concentrations at 3-minute intervals, starting with 1:800,000 and increasing, until vasoconstriction is observed. Vasoconstriction response to cold was measured by applying an ice pack to the closed eyelid for increasing-length intervals until constriction is observed. The group of normotensive non-diseased subjects included 72 subjects with no known disease. The group of hypertensive subjects included 14 men and 31 women (average age 31, ranging from 3 to 78). Blood pressure in this group was consistently greater than 140/100 in all subjects. The group of normotensive with disease included 33 patients having such disorders as multiple myeloma, cirrhosis, peptic ulcer, polycythemia, and psychosomatic conditions. None of this group had any history of hypertension. Some of the studies, such as measurements of peripheral blood flow, were conducted on a subset of the population, 10 cases from each group. in the normotensive non-disease group: the vessels are tonic with good flow (euvascular). in the hypertensive person: vessels are narrowed and tissue is ischemic with deficiency of vessels, and reduced flow. in the normotensive with disease group: variable, ranging from normal to abnormal, with no pattern. Hypertension is associated with reduced blood flow and vessel narrowing. Example vessel topography is illustrated in the figures. in the normotensive non-disease group: the vessels are mostly non-tortuous, with only 8% graded as high as 1.
in the hypertensive person: vessels are significantly tortuous with grade 3 to 4 found in about 2/3 of cases. in the normotensive with disease group: slightly more vessel tortuosity than normal cases..
Clearly, vessel tortuosity is associated with hypertension. Hypertensive cases had blood cell velocities that were lower than the normotensive blood cell velocity in all three segments of the conjunctival microvasculature. Among the hypertensive, all with blood pressures over 140/100, blood cell velocity in the end arterioles were 21% of normal; in the capillaries 38% of normal, and in the collecting venules 32% of normal. 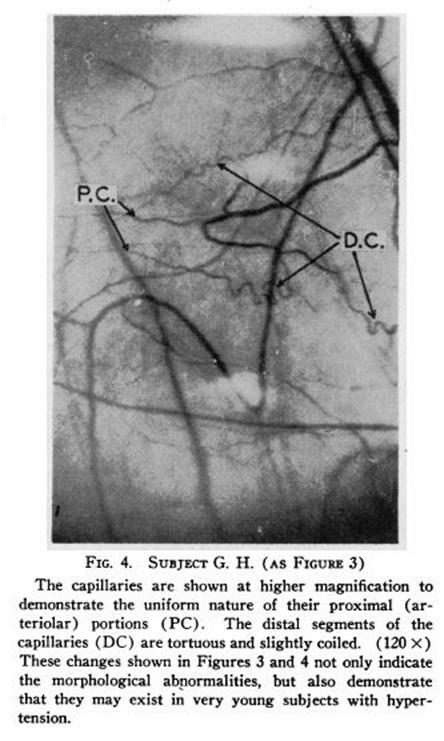 Among the hypertensive cases, the blood cell velocity was 1/3 to 1/5 found in the control group in all three segments of the microvasculature. Among the normotensive non-disease cases, blood cells had a velocity in the collecting venules that was 51% the rate observed in the end arterioles, whereas the hypertensive group cell velocity in the collecting venules is 78% of the velocity in the arterioles. This suggests that causal factors of the impaired circulation in hypertension are in the arterial segments. The blood circulation in hypertensive patients is under high pressure with reduced velocity. The heart is working hard to push the blood through the arterial tree, but is meeting considerable resistance to the flow, and despite pumping under high pressure, the flow is reduced. In the normotensive non-disease group, the spontaneous vasomotor activity is present only to a limited extent, and in only 25% of subjects. In the hypertensive group, spontaneous vasomotor activity is elevated, with the closed phase dominant. In the normotensive with disease group, spontaneous vasomotor activity was usually not seen, but when found was variable, ranging from normal to abnormal, with no pattern. 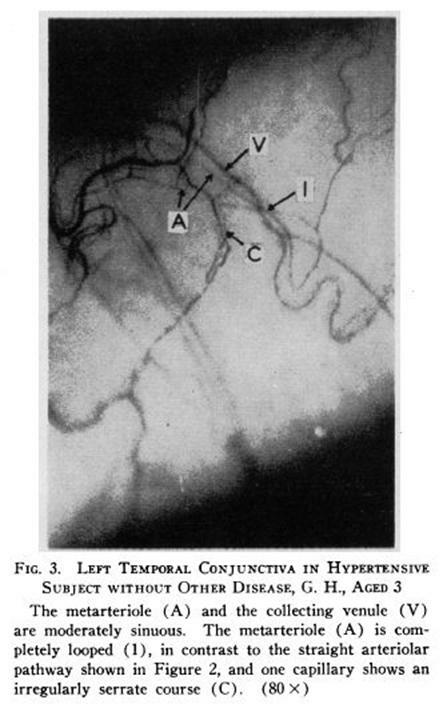 The hypertensive cases showed hyperactivity of the precapillary sphincter vasomotion, but with impaired flow. In the normotensive non-disease group, the concentration of epinephrine needed to produce vasoconstriction was an order of magnitude less than that required for the hypertensive group. Among hypertension subjects, sensitivity to topical epinephrine was observed to be 10 times greater than the normotensive subjects. Among the normotensive with disease cases, sensitivity was variable, ranging from normal to abnormal, with no pattern. This group was elevated above Group I (Normotensive non-disease) only in Laennec’s cirrhosis and hyperglobulinemia. Hypertensive cases were significantly more sensitive to topical epinephrine than the control group. In the normotensive non-disease group, there was no observable effect of cold application to vasoconstriction, whereas the hypertensive group had about one third responding to cold. In the normotensive with disease group, Vasoconstriction reaction to cold was found to be variable, ranging from normal to abnormal, with no pattern. Patients with hyperglobulinemia in this group responded with grade 4 vasoconstriction, stagnant flow, and red cell aggregates. Hypertensive cases were significantly more sensitive to the topical application of a cold pack than the control group. 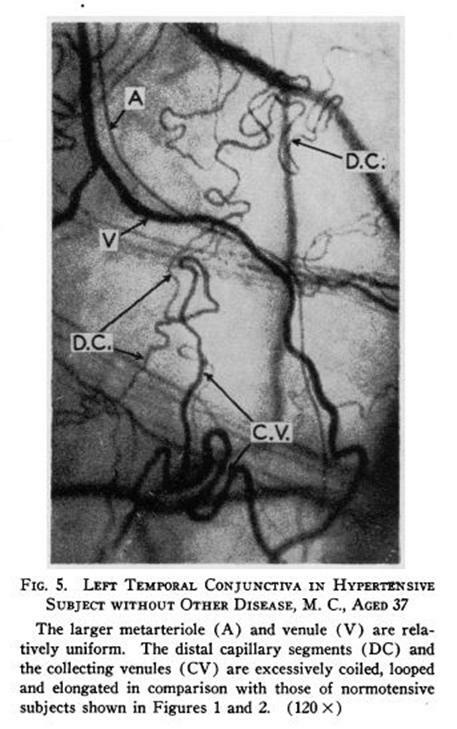 From consideration of all the measurements and differences between hypertensive patients and controls in the structure and behavior of the conjunctival microvasculature, it is clear that hypertension is related to impaired blood flow, vessel narrowing, and vasomotor hypersensitivity. Among the hypertensive patients, the heart is working harder than normal to push blood cells through the arteriolar tree, but is meeting with elevated resistance, resulting in impaired blood flow. The cause of the higher flow resistance appears to be vessel narrowing. Among these patients, not only is the peripheral circulation reduced, the microvessels are hypersensitive to constricting factors. The study shows that high blood pressure is a result of not simply ‘arteries clogged with lipids’ but abnormal vascular topography and abnormal vasomotor sensitivity. The observational methods used in this study include measurements of structural and behavioral properties of the conjunctival vasculature. With current generation cameras and image processing techniques, the clinician can record these images and subject them to automated analysis to assess risk factors for hypertension.